Standing Paper Towel Holder by Old Dutch keeps your paper towels handy and tidy on the countertop. Portable design lets you easily bring paper towels to the job at hand. Weighted base and convenient tear-off bar. Versailles Kitchen Tool Caddy by Old Dutch is a decorative and convenient solution to storing your kitchen tools easily at hand. 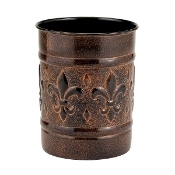 The Fleur De Lis design is handcrafted by skilled artisans, making each an individual work of art. New from Old Dutch International - Never misplace your wooden spoon again. Keep your kitchen utensils together in style with this caddy, made from antique pewter-plated stainless steel and embossed with a handcrafted chaised motif. Tools not included. New from Old Dutch International - 7" x 7" Art Nouveau Cookie Jar with Fresh Seal Cover, 4Quarts". Art Nouveau" 4 Qt. Cookie Jar. Travel back to 1910 Paris with this handsome Cookie Jar. Beautifully chased design is handcrafted and finished by skilled artisans, making each an individual work of art. Acrylic Canister Set // This clear canister set is made of acrylic with polypropylene lid and BPA free. Their capacity is 3.5C, 5.5C and 9C. The largest one measures 5.5"D X 8"H with lid on 9.5"H. All canisters... Cookie jar.-Material: Iron.-Fresh seal technology to keep contents fresh.-Hand embossed.-Wash with warm soapy water and hand dry clean.-Capacity: 4 Quart. Construction: -Steel construction with a warm. "Heritage" Napkin Holder by Old Dutch keeps your napkins tidy on the table. A beautifully chased Grapevine motif is handcrafted by skilled artisans, making each an individual work of art. Warm Antique Copper finish over steel. This antique-look copper caddy not only holds a large assortment of kitchen utensils (not included), but can serve as a vase for dried flowers or a small fireside container for kindling. 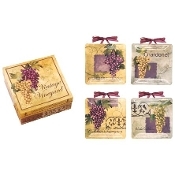 Measuring 6 by 4-3/4 inches, the caddy is skillfully hand-embossed with a grapevine motif around its center. New from Old Dutch International - 8” x 2” x 5¼” Antique Embossed “Victoria” Napkin Holder. Napkin Holder by Old Dutch keeps your napkins tidy on the table. New from Old Dutch International - "Art Nouveau" Napkin Holder keeps your napkins tidy and close-at-hand. 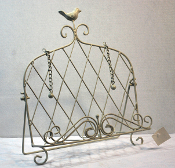 Metal construction with a warm Verdigris and Coppertone finish. Coordinates with other items in "Art Nouveau" line such as Canister Sets, Cookie Jars and Kitchen Tool Caddies. 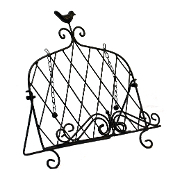 New from Old Dutch International - "Art Nouveau" Standing Paper Towel Holder keeps your paper towels handy and tidy. Portable design lets you easily bring paper towels to the job at hand. Weighted base and convenient tear-off bar. A revolutionized spice rack constructed like fine furniture with a hard rock smooth maple wood frame. With three separate sizes on a swivel base keep all your spices at your fingertips. Old Dutch 4-Quart Hammered Cookie Jar, 6-3/4 by 9-Inch, Copper - With it's hammered finish and large 4 Qt. capacity, this copper-plated steel Cookie Jar is the perfect countertop storage solution. "Fresh Seal" cover technology keeps baked goods fresh and safe. Old Dutch 4.5 Inch Solid Copper Tankard with Brass Handle, Set of 6This solid copper tankard is simple and beautiful, accented with a brass handle. It has a 1 pint capacity and stands 4 1/2" tall. G! For Gifts Ceramic Measuring Cups A set of cute little painted ceramic measuring cups, a perfect gift for the baker in your family. Remember, baking isn't an art, its a science! Make sure your favorite baker gets his or her measurements right!... G! 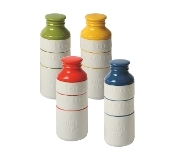 For Gifts Measuring Cups These cute ceramic measuring cup stack on top of each other like nested dolls. Includes a 1/4 cup, 1/2 cup and a full cup. Comes in yellow, blue, green or red. Stacks on top of one another Comes in four different color Includes 1/4 Cup, 1/2 Cup and 1 Cup. Love to cook? Love comedy? Bring out your silly side in the kitchen with one of these Giftcraft nylon and silicon spatulas. Made of high quality material, comes in four different sayings on four different colored spatulas. Bring a little goofy comedy to your kitchen with one of these high quality nylon and silicone mixing spatulas from Giftcraft. Comes in 4 different colors with 4 unique sayings on each one. Add a little fun to your kitchen with one of these playful spoons from Giftcraft. There are four different phrases available on four different colors. Nonstick high quality nylon and silicone design means a long lasting product that makes a great gift for anyone who loves to cook. Cream, Blue, Green and Red Stoneware 'This Kitchen is DIY... do IT Yourself', and 'The KITCHEN IS THE Heart of THE HOME' Collectible Kitchen Utensil Accessory Jars, (2 Sty) A Perfect Addition for Any Kitchen Countertop 4.5" x 5" x 6.7"
Wild Eye Designs did it again! Be the first to have the latest Utensil set for your kitchen. The Ladle Lady will be your new favorite kitchen accessory! Dressed in a stylish lace apron, this fashion-forward silhouette is surrounded by 6 plastic utensils. 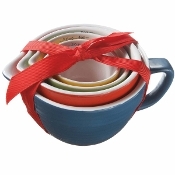 A fun and stylish way for the newlywed to keep new recipes! 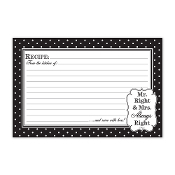 These 4 x 6 recipe cards are printed in full design, offer ample writing space for favorite family recipes (front and back!) and come in a pack of 36! 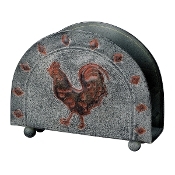 New from Old Dutch International - "Country Rooster", 6-1/2 by 2 by 5-Inch Napkin Holder by Old Dutch keeps your napkins tidy on the table. 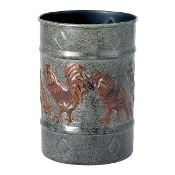 A beautifully chased rooster design is handcrafted by skilled artisans, making each an individual work of art. Can’t find a corkscrew and bottle stopper when you have the perfect bottle? This clever Wine Apron will solve both problems. New from Old Dutch International - 4-1/2-Inch Diameter by 6-1/2-Inch Height Country Rooster Kitchen Tool Caddy by Old Dutch is a decorative and convenient solution to storing your kitchen tools easily at hand. Ounce Solid Copper Moscow Mule Shot Mugs, Set of 8, When not in use, these mug shots make great home decor items, housewarming gifts, ornaments for a tree or gift packaging. Copper is one of those treasured kitchen finishes that never goes out of favor. Adding classic warmth to any kitchen, this hammered-copper caddy comes with seven wooden tools and a wire whisk--making it a great gift for a start-up kitchen or second home. Stainless Steel Hammered 4-Piece Canister Set With their hammered finish and generous storage capacity, these stainless steel canisters are the perfect countertop storage solution. Stainless Steel Hammered 9-Piece Tool Caddy Includes: -Includes starter set of 8 assorted wood and metal kitchen tools. Dimensions: -Overall dimensions: 6.25" H x 4.75" W x 4.75" D. Old Dutch Stainless Steel Hammered Cookie Jar with Fresh Seal Cover, 4-Quart, 6.75 by 7.5-Inch With it's hammered finish and large 4 Qt. capacity, this stainless steel Cookie Jar is the perfect countertop storage solution. 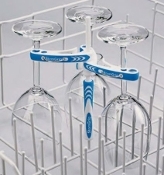 StemGrip securely holds your wine glasses from damage during dishwashing. 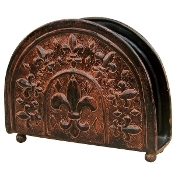 "Versailles" Napkin Holder by Old Dutch keeps your napkins tidy on the table. A beautifully chased Fleur De Lis design is handcrafted by skilled artisans, making each an individual work of art. Warm Antique Copper finish over steel. 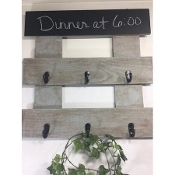 Wooden Pallet Chalk Wooden Coffee Rack This rack would be a great organiztional addition Chalk board for leaving notes Coffee cup storage or key holder Country of Manufacture: United States Make a perfect onion blossom just like in your favorite restaurants. The Orka 11 inch Silicone Splatter Screen will protect you from dangerous hot oil and grease splatters. The silicone screen is designed to allow steam to escape (heat resistant to 570F/300 C) while keeping you perfectly safe. 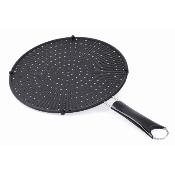 The Orka 14 inch Silicone Splatter Screen will protect you from dangerous hot oil and grease splatters. The silicone screen is designed to allow steam to escape (heat resistant to 570F/300 C) while keeping you perfectly safe. Create healthy chips and crispy snacks in minutes-all in your microwave with the Top Chips Maker. Crispy chips and snacks are achieved without any oils or fats, cooking up light and crispy, all with the use of your microwave. 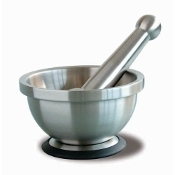 The Orka Motor and Pestle Stainless Steel Grinder is perfect for all herbs and spices. Solid stainless steel double walled construction is easy to clean. Has rubber grip base to prevent slippage. Studies show time and time again that one of the healthiest of all cooking methods is steaming. Steaming helps retain valuable vitamins and nutrients in food, without all the added fat. 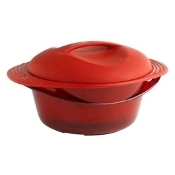 Orka Silicone lids designed to prevent splattered dishes in the microwave, stove, or oven and fit any size dish perfectly. 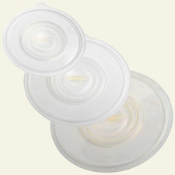 The set of three lids by Orka come in three sizes. The OrkaPlus Silicone Oven Mitt in Red combines safety, style and comfort to an everyday household item. The award winning OrkaPlus Silicone mitt with cotton lining in red, purple or green is strong and flexible for everyday kitchen safety. This is great for all tailgating enthusiasts. Each spatula features your favorite college teams logo on it. 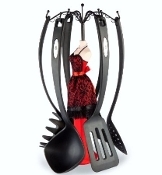 Show that you are the ultimate fan dedicated right down to your cooking utensils. 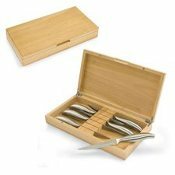 6 piece stainless steel knife set. Thank you for browsing our Kitchen Tools for Safe Easy Cooking collection!